Every since treating myself to one of the petite little scones at Starbucks on a recent publicity trip, I’ve been dying to make them. Because I know without a shadow of a doubt that I could make them for 90% less than what I paid for at the ‘bucks. Before we get to the recipe, I’d like to have a pronunciation lesson. I have a friend who has lived in England and she told me recently that scOnes (sc-long o sound-nes) are actually pronounced scOnes (sc-short o sound-nes). This was news to me…and I quite like saying it like an fine English woman from the countryside. Have you heard that?! How do you pronounce SCONES!? Anyways, here they are. For about $.10 a piece. Less if you figure that I get the maple syrup and vanilla beans for free using Amazon credit from Swagbucks. The pictorial tutorial…for all you visual home chefs out there! Flour, sugar, salt powder. Add them to a mixing bowl. 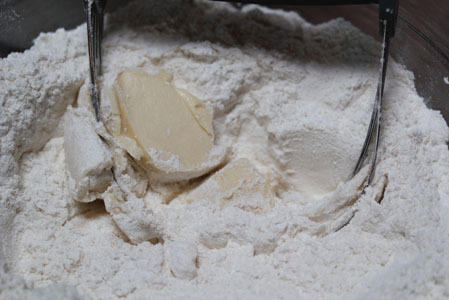 Use the pastry blender or fork that you will use to cut the butter in to whisk them together. Cut in the cold butter with a pastry blender or fork. Until crumbly. 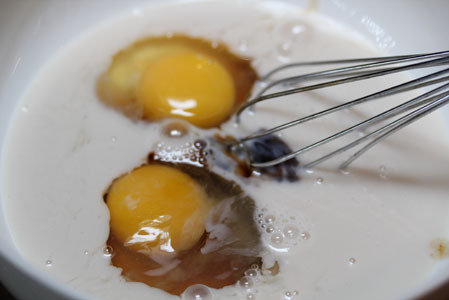 In a small mixing bowl, whisk together the eggs, milk, maple syrup and vanilla. 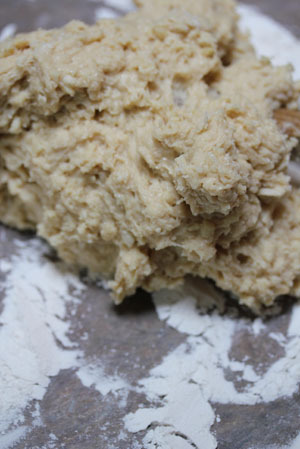 Pour into the dry ingredients and stir with a wooden spoon until a dough forms. Add the almonds to the dough and work them in with the wooden spoon. 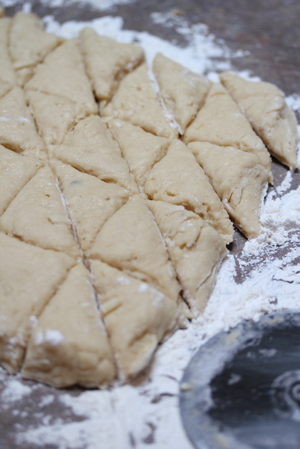 Place the dough onto a well floured surface and shape it into a rectangle that’s 3/4 – 1 inch high. With a pizza cutter, cut it into 24 squares. 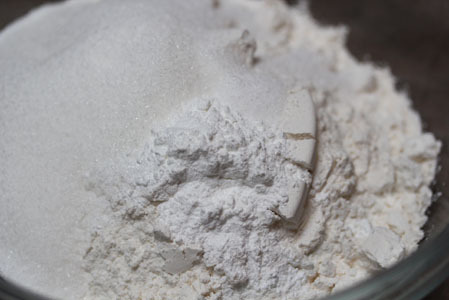 Dip the pizza cutter into the flour nearby to help it cut through better. Then cut the squares that you made into little triangles. 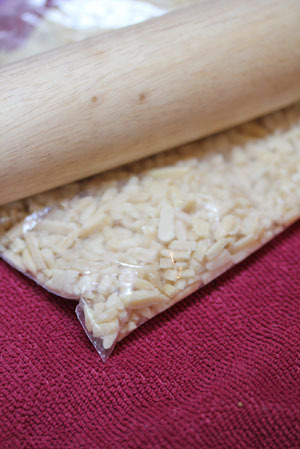 Place them onto a baking sheet with parchment paper. Place the baking sheet into the freezer for 20 minutes. Preheat the oven to 425. 13 to 15 minutes. Meanwhile, make the glaze. 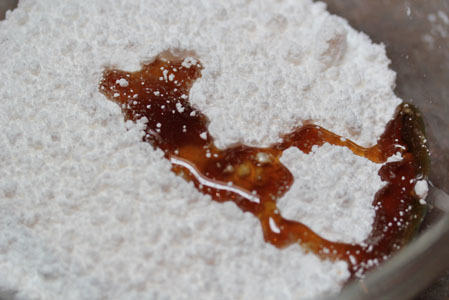 Add the powdered sugar and maple syrup in a small mixing bowl. 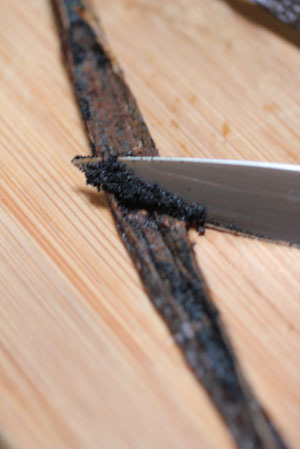 Slit the vanilla bean lengthwise, being careful only to slit the top side of the bean and not cutting all the way through to the cutting board. 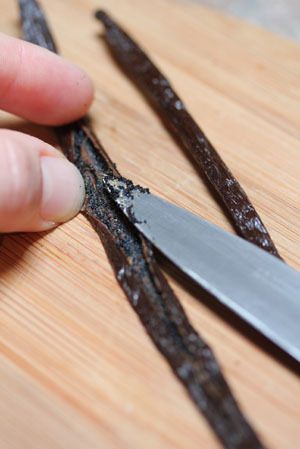 Pull the edges away from each other for the length of the bean, exposing the vanilla seeds inside. 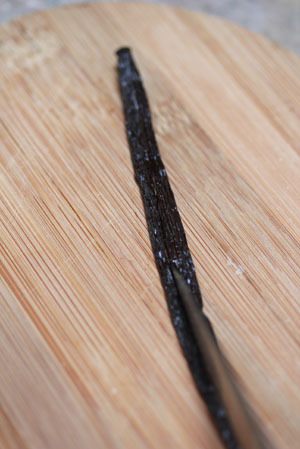 With the small edge of your knife, run it down the length of the vanilla bean, gathering up all the tiny seeds. Drop those in with the powdered sugar. Add the 3 Tbsp of water and stir until the glaze forms. Add 1 tsp of water at a time, until reaches the desired consistency. Once slightly browned on top, remove from the oven. I intended to make these for dessert, but they’d make a lovely afternoon snack. With a cup of tea or coffee! 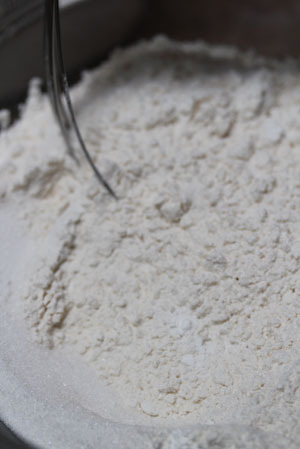 In a mixing bowl, whisk together the flour, sugar, salt and powder. 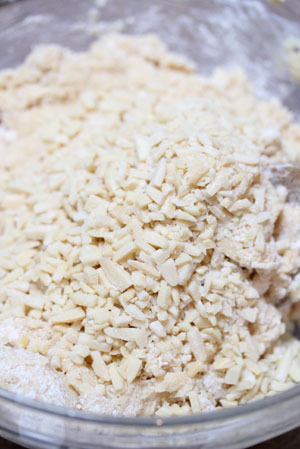 Cut in the cold butter until the mixture is crumbly. 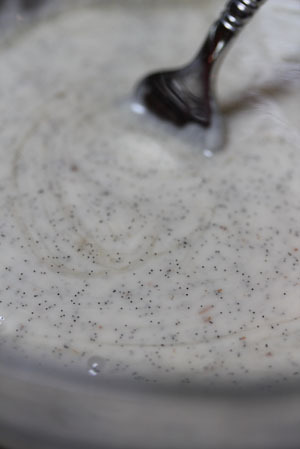 In a small mixing bowl, whisk the eggs, vanilla, maple syrup and milk. 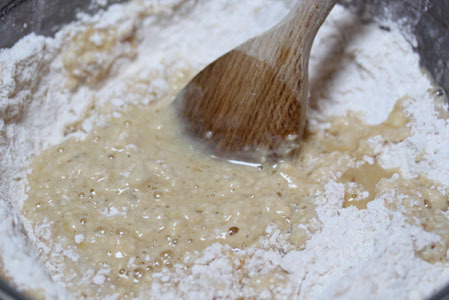 Pour into the dry ingredients and stir with a wooden spoon until a dough forms. Crush the almond slivers. Stir them gently into the dough. 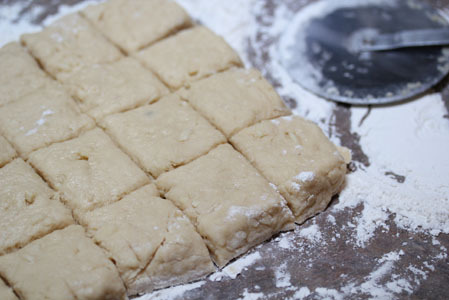 Place the dough ball on a well floured surface and form the dough into a rectangle about 3/4 to 1 inch high. Cut into squares with a pizza cutter. Then cut the squares into triangles. 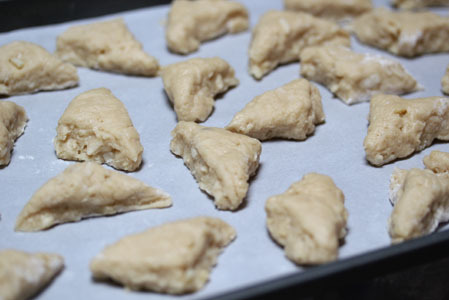 Place the mini scones onto a baking sheet with parchment paper. Place the baking sheet in the freezer for 20 minutes. Preheat the oven to 425. 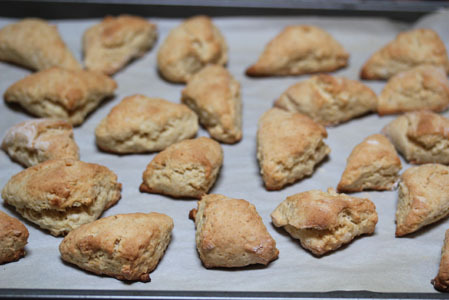 Bake the scones for 13 to 15 minutes, or until golden brown on top. Let cool slightly before glazing. Generously glaze the scone bites. Let cool completely before freezing. 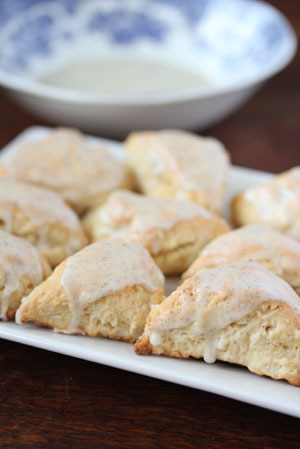 Enjoy Maple Almond Scone Bites with Vanilla Glaze for dessert, or afternoon snack with a cup of tea or coffee. 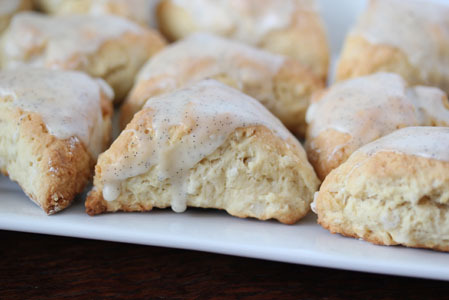 These do look great – I love the Petite Vanilla Scones from SB’s. I learned long ago that the word is pronounced with the ‘short o’ sound. My place of employment was owned by a British organization! Learned quite a few British words and ways during the 14 yrs there…was a lot of fun. These look wonderful! I purchased some orange cranberry scones on markdown at Kroger around the holidays and they were the most delicious things I’ve ever eaten! 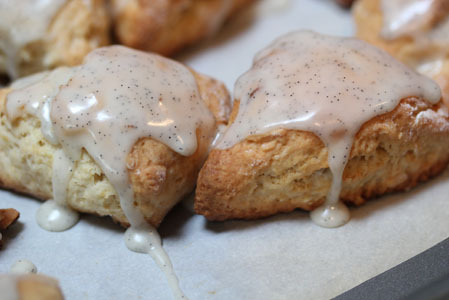 I love to make and freeze scones ahead to pull out of the freezer but never do a glaze until after they have been reheated. Does the glaze do okay in the process? They’ve always done okay for me. In fact, I had one a few minutes ago…was fine! I’m a Scot, and I love this Blog, and enjoy all your recipes! There are different pronunciations of the word “Scone” nationwide throughout the UK . Usually in the north, (Scotland) we say “Scones” with a short O. In the southern counties of the UK, it tends to be pronounced with a long O. Everyone however agrees on one thing.- They are really delicious! Thanks for sharing Fiona! You are right…the most important is that they taste yummy! 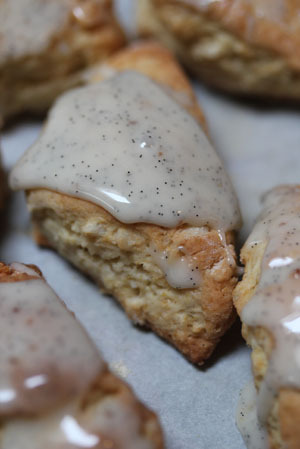 I was lucky to taste test these scones when Erin made them. They were so good. And my kids couldn’t get enough of them. They were so cute and little and yummy! Make them. You won’t be sorry! These look delish! I am an American living in Australia, and my aussie friends love to laugh hysterically at my american pronunciations of words like Scone vs. Scon and Pastie vs. Paaastie ( a meat pie type thing) and of course the hysteria is mutual, as Aussie pronunciations crack me up still after three years. Thank you so much!! These were delicious. I didn’t have vanilla bean so I just tweaked the glaze a bit. So cute and fancy. Yep, over here is Aussie land it is a short o like in ‘hot’ for scone. Also there is a trick, the scones will rise more if you bake them touching. They help each other up. not sure if this is buried too much to get an answer but… Do I have to freeze these? Is this just to keep them fresh longer? And how do I warm them when frozen. I’m assuming that we can just eat them as is when they are done right? thanks! Cool completely before freezing. They could stay room temp in a tupperware for a few days. Warm them in the microwave or on the counter…they wouldn’t take long on the counter because they are so small! 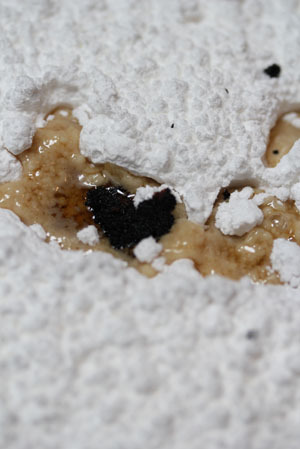 If you don’t have vanilla bean can you use vanilla extract? Yes…but add it drop by drop to the glaze. 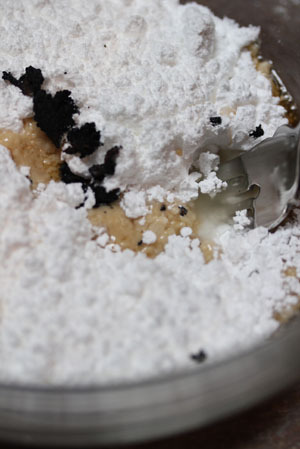 And if you add too much, mix in a little more powdered sugar. Hope you enjoy them! I have never had a scone in my life so im wondering as well… Can we eat them hot?? I realize I dont have to freeze them but do they have to cool off?? Can you eat them warm out of the oven?? We have a nut allergy in our house- wonder what you could sub for the almonds? Great blog, thanks for the recipe your step by step guide was very helpful. My vanilla scones turned out almost perfect and looked just like yours in the picture.